THE LIBERTY WING: WHAT’S THE USAF DOING OVER NORWICH? Posted on October 30, 2016 by Norwich Radical	in Inter|national and tagged air force, airstrikes, army, British army, CND, cold war, drones, ethics, Europe, F-15E, France, Goldsboro, Lakenheath, Liberty Wing, military, military presence, Nato, norwich, nuclear bombs, nuclear weapons, Nukemap, Pakistan, Palomares, RAF, Russia, Strike Eagle, Syria, uk, United States Air Force, US, USA, USAF, war, war crimes, Women of Greenham Common, Yemen. The United States has had a military presence in the UK since the Second World War, (when, among many others, my great-uncle flew with the US Army 8th Air Force from Norfolk). Today they have around 8,920 ‘personnel’ of various sorts on British soil, the majority of them from the USAF, the air force. The planes over Norwich are from the 48th Fighter Wing based at RAF Lakenheath in north-west Suffolk (incidentally (and slightly goofily) known as the Liberty Wing). It’s their F-15E Strike Eagle fighter-bombers that regularly fly over and around Norwich and large parts of East Anglia. The F-15E is capable of carrying nuclear weapons, by the way, namely the B-61 nuclear bomb. According to the morbidly entertaining Nukemap, one of those dropped on my office in the city centre would pretty much level every building in the city out to the airport in one direction and Cringleford in the other, a circle about 10km across, and destroy the entire city. A rough casualty estimate suggests around 113,110 dead and 101,500 injured, with a fallout plume that could stretch all the way to London. Good thing they’re on our side, I suppose. A rough casualty estimate suggests around 113,110 dead and 101,500 injured, with a fallout plume that could stretch all the way to London. Good thing they’re on our side, I suppose. Lakenheath is actually one of the last USAF bases in the United Kingdom, part of a steady reduction of US military garrisons in Western Europe since the end of the Cold War. Most US units have shifted east into new NATO members like the nine countries added in 2009, many of whom share borders with Russia. The Russian government is beginning to be concerned by these movements, especially by the military exercises NATO conducts across Europe, many of which are openly intended to simulate an invasion by Russian forces. While this seems like innocuous realpolitik (who else is going to invade? Martians? ), it should be noted that exercises of this type have literally nearly resulted in nuclear exchanges in the past, and are one of the many forms of Cold War provocation that still taint relationships between the US and Russia. Don’t believe for a second that it’s just preparedness; Both NATO and Russia are constantly prodding and testing each other, as they have been since before the Second World War ended. Now, despite all the reasonably concerning things I’ve just said, I’m not trying to scaremonger. I don’t really believe the US forces in the UK represent an occupying force or put us at undue risk of nuclear war (well, they’re no more dangerous to be near than our own soldiers, who need Prime Ministerial protection from the consequences of their war crimes) I’m not calling for the US to pull its troops out of our country, although they did leave when the French asked them to, so it’s worth a thought. 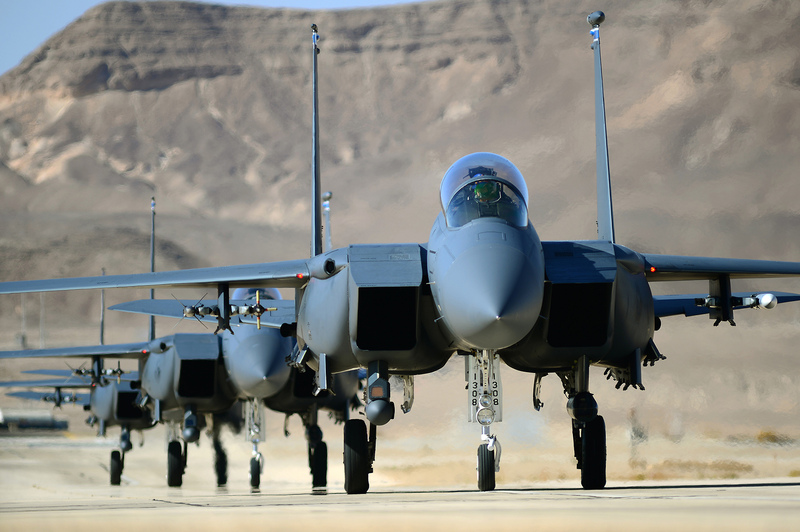 They aren’t even a major part of the still massive US nuclear arsenal, with the fairly old F-15s largely used for air defence against 9/11 style hijacking attacks and sabre-rattling Russian bomber missions rather than as strike aircraft. That paragraph of reason aside, the United States Air Force is not very good at handling its nuclear weapons. It might just be that they have a lot of them (they do), but there have been at least three major nuclear accidents per decade since the Bomb was invented, and their command and control systems are persistently incompetently managed and worryingly archaic. Some of those accidents have involved the USAF accidentally dropping armed nuclear weapons over their own territory, with Goldsboro in North Carolina very nearly suffering fission-based urban regeneration in 1961 and Palomares in Spain finding three hydrogen bombs washed up on the beach in 1966. More recently in 2007, the US military accidentally transported six nuclear-tipped cruise missiles across the country then left them on the tarmac unguarded for 36 hours. I’d like to at least hope that the people controlling the city-busters at Lakenheath and around Europe have a bit more sense than that, but in any system human error is inevitable. We’ve avoided a major military nuclear disaster for seventy-one years. How much longer does the world have before a statistically inevitable major screw-up occurs? More to the point, do we really want said screw-up to happen on our small, densely populated island? Oh, and the US just launched an undeclared war on Yemen. Seriously. Along with the pointless, indiscriminate, drone strikes against various nations including Pakistan, a country the US is not at war with and which is indeed considered an ally and the continuous bombing of Syria, the US has now launched airstrikes and naval attacks against Yemeni rebels. The incident is the latest in a proxy war being waged by an American-backed, Saudi-led coalition against Houthi rebels in the country. As one of the first USAF bases on this side of the Atlantic, Lakenheath is almost certainly involved in logistics for attacks in the Middle East. There are moral and ethical objections to US deployments on our soil that I’d argue are more pressing than the CND protests of the previous century – after all, the Bomb hasn’t been used in anger since 1945, but America has been bombing other countries and civilian targets nearly constantly since then. We’ve avoided a major military nuclear disaster for seventy-one years. How much longer does the world have before a statistically inevitable major screw-up occurs? Whoever wins the US presidential race, the American political climate means that the US military’s reach is only going to extend and further conflicts are inevitable. Perhaps the French had a point when they demanded that NATO troops withdraw from their country. The Women of Greenham Common officially stopped protesting in 2001, but the fight’s not over. Perhaps we can rally some Brexit nationalism to a more productive cause? The current version of the F-16 is the (Silent) Strike Eagle, the F15 is the only tactical aircraft in the present US arsenal that can carry nuclear weapons. The ones depicted probably weren’t serving in England if the desert background is any indication.